Several years ago, a dating web-site ran a commercial offering five matches for those who signed up for the first time. When we first saw this commercial, Marianne astutely pointed out, "They must not have much confidence in their process if they are giving you FIVE matches..."
I immediately thought that this was a wonderful demonstration of the way some people view church. Eharmony is built on the idea that their thorough analysis of every person almost always leads to compatible relationships. Unfortunately, from time to time they discover people for whom they don't have a match. Rather than suggest a match which falls below their standards, they choose to apologize to that person and say, "We can't hook you up right now." Apparently, other dating sites take a different approach. They have the philosophy that if they throw you into as large a pool of people as possible, you're certain to find a match. Unfortunately, a lot of people spend a lot of time pursuing a lot of relationships with a lot of people with whom they DON'T have a lot in common. The more unfortunate result is that a lot more feelings get hurt and a lot more people are rejected by actual people they have invested themselves in (rather than a computer with whom they have no relationship). I see a lot of churches that take the second approach. They create as many programs and "ministries" as they can, trying to meet the needs of every niche market that might possibly exist. Unwilling to ever say "no" to anything, they continue to multiply activity and in the end the real point of church is lost as people come to understand the "church" as a place that is made for THEM to have THEIR NEEDS met. And if the church doesn't meet their needs, they move on. 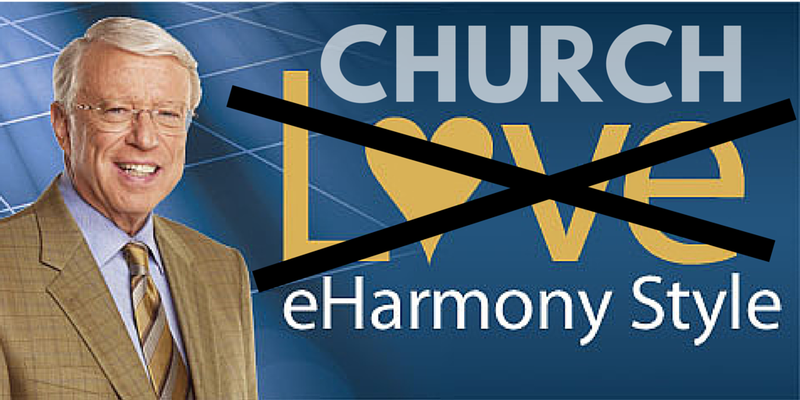 I don't think the church should ever reject anyone (so that's where the analogy with eharmony kind of breaks down). But what I really like about Eharmony's philosophy is that they are able and willing to maintain their standards and their singular focus, even if it might offend people. I would love to see more churches who were willing to say, "We're about worshiping God and making disciples, period." Of course what every church would say that. But to really mean it, the church needs to be willing to say, "So if the most important thing to you is something other than that, you'll need to look elsewhere." I'm not saying that all the other things churches do (potlucks, sports leagues, scrapbooking, super bowl parties, etc.) are bad. In fact, many of these things are helpful and can really meet the some of the needs people feel. BUT THEY SHOULD NEVER DISTRACT FROM THE MOST IMPORTANT THING. If people within the church do these "extra" things and make them happen, great! As long as it isn't at the expense of the true focus of the church and as long as there isn't an expectation that these activities are tied to the identity of the church. The singular focus of the church must always be on Christ and pointing people to Him. All that to say... I don't think it's such a bad thing that EHarmony rejects people. In fact, I think it's a good thing. And if I were single, and looking for a dating service, I'd pick Eharmony because of their demonstrated commitment to doing what they do well.